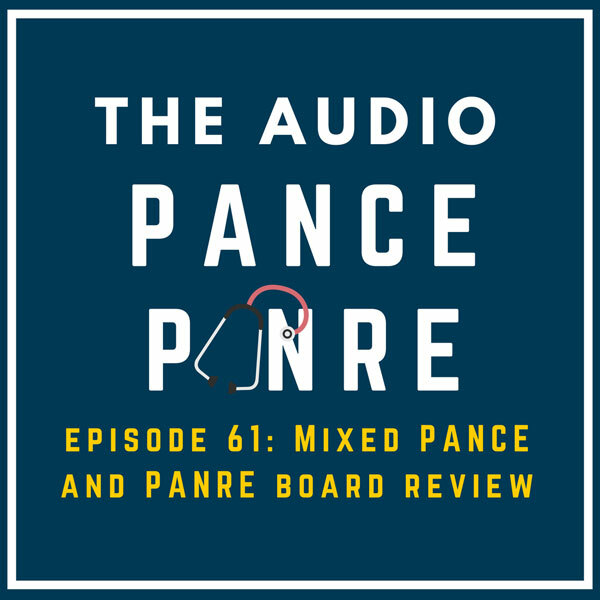 Welcome to episode 61 of the FREE Audio PANCE and PANRE Physician Assistant Board Review Podcast. 1. An 18-year-old male presents with pain in his wrist after he fell off of a moving motorcycle. Physical examination reveals tenderness in the anatomic snuffbox. No fracture is noted on plain radiography of the wrist. Which of the following is the recommended treatment for this patient? Even with normal initial radiographs, patients with a consistent history and tenderness in the anatomical snuffbox are treated as a stable fracture with immobilization in a thumb spica cast. Casting is recommended for all presumed nondisplaced scaphoid fractures. 2. A solitary pulmonary nodule is found on a pre-employment screening chest x-ray in a 34-year-old non-smoking male. There are no old chest x-rays to compare. Which of the following is the most appropriate next step in the evaluation? In the absence of old x-rays in a nonsmoking individual less than 35 years old, CT scan of the chest is the next step in the evaluation of a solitary pulmonary nodule. B. A needle biopsy would be indicated for a person greater than 35 years old and/or with a history of smoking to evaluate a solitary pulmonary nodule. C. Positron emission tomography (PET scan) would be indicated if the CT scan was nonconclusive. D. Fiberoptic bronchoscopy would be indicated only in the presence of a history of tobacco use or if the lesion was suggestive of malignancy. A. agitation and decreased cognition. B. visual hallucinations and diaphoresis. C. autonomic hyperactivity and dehydration. D. mental confusion and sensory hyperacuity. Answer: A. agitation and decreased cognition. Anxiety, decreased cognition, tremulousness, increasing irritability, and hyperactivity are common early clues to impending delirium tremens. Mental confusion, tremor, sensory hyperacuity, visual hallucinations, autonomic hyperactivity, diaphoresis, dehydration, electrolyte disturbances, seizures, and cardiovascular abnormalities are common signs and/or symptoms of full-blown delirium tremens. 4. Dental caries are caused by which of the following organisms? Streptococcus mutans is the principal organism that helps to demineralize the enamel. Intranasal desmopressin is effective in 50% of patients treated and is the treatment of choice. A. Oxybutynin chloride is used for bladder spasms. It cannot be used for children under 5 years of age and is not indicated in primary enuresis. B. Imipramine is an older form of treatment that is moderately effective, but many patients relapse when therapy is stopped. This is no longer considered the treatment of choice. C. TMP-SMX is indicated for urinary tract infections that may cause secondary enuresis, but it is not used in primary enuresis. 6. A 47-year-old female presents to the clinic with complaints of prolonged, heavy menses that have been getting progressively worse for 3 years. She denies any pain. On physical examination, enlargement of the uterus with multiple smooth, spherical, firm masses is noted. A CBC is consistent with a mild anemia. Which of the following is the most likely diagnosis? Abnormal uterine bleeding and irregular enlargement of the uterus are most consistent with leiomyoma. Pain is rarely present unless vascular compromise occurs. B. While adenomyosis may present with hypermenorrhea, dysmenorrhea is often also present. Physical examination would reveal the presence of diffuse globular uterine enlargement, not the irregular enlargement as noted in the case presented. C. Endometriosis presents with dyspareunia, dysmenorrhea, and infertility. If the pelvic exam were abnormal, uterine findings would include tender nodules in the cul de sac, not the uterus. D. While endometrial polyps are compatible with the history of abnormal uterine bleeding, the uterus would be normal size without the irregular enlargement noted in the case presented. 7. Which of the following is the laboratory test that marks recovery from Hepatitis B infection and non-infectivity? Specific antibody to HBsAg appears in most individuals after clearance of HBsAg which indicates recovery from hepatitis B infection, non-infectivity, and immunity. B. This test establishes infection with HBV and implies infectivity. C. Presence of the hepatitis B core antigen reflects active infection. D. Patients who have immunity to hepatitis A do not have immunity to hepatitis B. A. just before a holiday. B. just after leaving an abusive spouse. C. when an abusive spouse arrives home after work. D. when an abusive spouse has been drinking heavily. Answer: B. just after leaving an abusive spouse. 9. A patient presents with an acutely painful and cold left leg. Distal pulses are absent. Leg is cyanotic. There are no signs of gangrene or other open lesions. Symptoms occurred one hour ago. Which of the following treatments is most appropriate? Embolectomy within 4 to 6 hours is the treatment of choice. A. Vena cava filters are used in the management of venous thromboembolic disease when anticoagulation cannot be done. C. Amputation is done only when no viable tissue is present. Cutting off a viable limb is never a good idea. D. Aspirin is used in the prevention and treatment of coronary disease and has no role in the treatment of peripheral arterial embolism. 10. A 53-year-old male is seen in the emergency department following a motor vehicle collision in which his knee impacted against the dashboard. The patient has a posterior knee dislocation that is promptly reduced in the emergency department. The patient currently has a palpable pulse in the dorsalis pedis and posterior tibial areas. Which of the following studies is mandatory? The popliteal artery is at risk for injury whenever a patient sustains a posterior dislocation of the knee and should be evaluated with an arteriogram despite the presence of pedal pulses. C. Compartment pressures are performed in cases of suspected compartment syndrome, not to determine the patency of the popliteal artery. The post Episode 61: The Audio PANCE and PANRE – Ten Mixed NCCPA™ Content Blueprint Multiple Choice Questions appeared first on The Audio PANCE and PANRE.